6 Marriage of a catholic with a divorced person. 8 Annulement of a first marriage. The marriage is considered by the Roman Catholic Church as a sacrament, that is "a visible sign of the grace of God". In the same way as six others, as are the baptism, the confirmation, the extreme unction, the confession and the consecration in the priesthood. It is a sacrament administered by the very spouses, the celebrant being witness. It is for that reason that the remarriage of a divorced person, already married at the church is not possible. However, after the civil remarriage, they can ask one time of prayer which avoids any ambiguity with the rite of the wedding sacrament. We also can, in certain cases, very rare, ask for the cancellation of the first marriage. 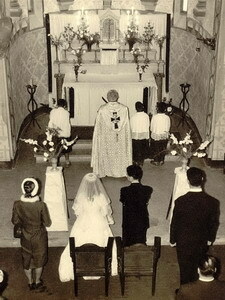 The conditions of the catholic marriage. - They accept the responsibility for having children (fertility). As such, the marriage demand a preparation: three meetings in the Center of Preparation for the Marriage (CPM) where meetings between engaged people, on one hand and married couples, on the other hand. The engaged have to meet a priest to prepare the ceremony and their married life, and possibly learn, if necessary for the Christian faith. At the end of this meeting, they draft a declaration of wedding intention, "a project of life which integrates the commitments"
Here are some points of new liturgies of the marriage, put down by Benoît XVI on July 2006. - The fiancés must be baptized and communed to have access to the marriage. - The importance of the Saint Spirit is rested during the ceremony - The laying on of hands of the celebrant on those of the couple is important, it symbolizes the union of the Church and the couple. - An exchange of presents with the celebrant will can be made at the end of ceremony. - As possible, the decoration can be more discussed for a long time with the celebrant, who is source of good advice for the couple. Finally, the celebrant will press on the fact that his role does not stop in the day of the wedding. He is also a referent in case of conjugal problems, a support in the difficult moments. Marriage of a catholic with a divorced person. you can see on http://www.divorceinfo.com/catholic.htm wich give a lot of linkx about this question. ""The marriage, in Protestant theology, is one of the privileged domains in which make visibiled the articulation of the spiritual and the social. From its point of view, "yes" in front of the mayor is also "yes" in front of God. There is no dichotomy between both. There is no "yes" civilian to whom would come to be added one "yes" monk, no more than there is "yes" monk who would also be one "yes" civilian. It is also the reason for which the legal obligation of the anteriority of the civil marriage on the church wedding was never felt, by the Protestantism, as an obstacle or a constraint. So, the role of the religious celebration of the marriage is not to marry the interested, because they are already walked past the mayor and because they are so opened in front of the society to which they belong."" The ceremony takes place about as that of the catholic marriage, but the Protestant church does not consider it as a sacrament. The commitment between the couple is concretized by a letter handed to the minister before the ceremony. Annulement of a first marriage. The church can accept to declare as nul a marriage, for a neglect in four fundamental pillars of the marriage: fidelity, indissolubility, freedom, fertility. These conditions must exist from the beginning of the marriage. Neglect fidelity: that one of the couple hid to the other one a love which lasted before and during their marriage. Fertility: that woman he hid, that is an infertility or any shape of incapacity to create with him. Also, if one of the two got married only to take of it an advantage (to acquire a nationality, or a title, or a fortune, or only to use his(her) spouse to quench his sexual urges without giving itself for all that to him, or still the one who would continue to live exactly as if he was a bachelor and if the spouse did not exist).